What if you could teach your body to burn more fat and preserve carbohydrates stores to improve health, reduce body weight and body fat and improve athletic performance? Not surprisingly, this is possible with a few adjustments to your daily nutrition plan. By using a little basic science combined with smart daily nutrition habits, it is possible to tap into your almost unlimited fat stores to use as energy while teaching your body to preserve its very limited carbohydrate stores. In the end, that means better health, improved body weight and body composition and better athletic performance. 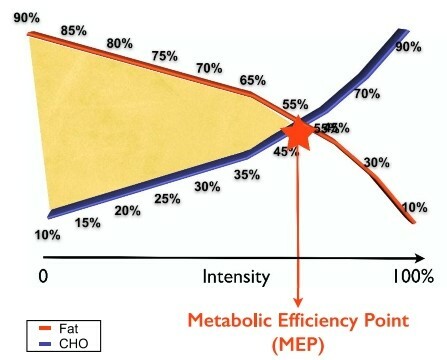 This “fat burning” concept can be easily described in two words: metabolic efficiency. There are two methods to improve your metabolic efficiency: exercise and nutrition. From an exercise perspective, it has been known for some time that exercising aerobically will enhance the body’s ability to burn fat at a cellular level. Don’t let that mislead you though. It is also important to get some higher intensity exercise balanced with the aerobic exercise. Interestingly, exercise only has a small (roughly 25%) impact on becoming a better fat burner. Nutrition is the powerhouse and can have a much more robust (roughly 75%) impact on your metabolic efficiency. I am going to move forward with explaining more about nutrition in this article since it has a greater impact. From a nutrition perspective, being metabolically efficient simply means being able to more efficiently use the nutrients that are stored in your body at the right times during rest and exercise. It is likely that you have heard of this scenario before as it applies to exercise: as intensity increases, the body prefers to use more carbohydrate and less fat for energy. Older scientific research has determined that our fat burning “sweet spot” is between 63-65% of maximal exercise intensity and training above that intensity will burn more carbohydrates and less fat. While it is true that you will burn more carbohydrate at higher intensities of exercise, the point at where your body crosses over from mostly fat to carbohydrate usage is highly variable and trainable. That’s right. I said trainable. As I have been eluding to, you can train your body to become more metabolically efficient through proper daily nutrition strategies. The great thing is that this isn’t rocket science. Eating too much of any one nutrient (carbohydrate, protein and fat) will develop metabolic inefficiencies. Focusing too much on eating too much of one food and a state of nutrient imbalance can occur. The solution is eating a combination of foods to control blood sugar which will optimize hormone levels that favor fat burning. Most people have about 50,000 – 80,000 calories stored in their body as fat. Even the leanest athletes still have around 30,000. Contrast that to only 1,400-2,000 calories stored as carbohydrates and you can begin to see the opportunity that exists to tap into your fat stores. Not only will this mean you can burn fat at higher intensities of exercise, which leads to preserving carbohydrate stores, but it also can lead to body fat and weight loss, improved blood lipid (cholesterol, LDL, HDL, triglycerides) levels, a decreased risk of many chronic diseases and better sleep patterns. The benefits, similar to your fat stores, are almost unlimited! 1. Adopt a nutritional paradigm shift. Get in the habit of combining foods that have protein, fiber (carbohydrates) and fat. It is these three nutrients that, when eaten together, will balance and optimize your blood sugar and control your hormone levels to allow for greater fat burning. I prefer to recommend vegetables, fruit and whole grains (in that order) for carbohydrate sources. 2. Follow the 90/10 percent rule and allow some “misses”. It is more than okay to allow what I term “misses” into your daily nutrition plan. But when you do, be sure it is minimal (10%) and eating or drinking them does not send you into a downward spiral. Enjoy the occasional treats such as chips, chocolate, cookies, etc but in small portions and lesser frequencies while focusing on combining nutrients 90% of the time. Developing your metabolic efficiency will take preparation, execution, and commitment on your part. This is a behavior change that can take time to adopt. Start by pairing protein, fiber and fat rich foods together at the majority of your meal times or snacks and you will be well on your way to becoming more fat adapted which will lead to enhanced health and improved performance. Good article w/ simple rules to follow. I remember in 1965 Mr Olympia Larry Scott & his trainer Vince Gironda saying success was 25% training & 75% nutrition. Larry was taking his protein powder w/ cream & that was definitely different from common belief.